Ares Games announces an agreement with game designers Martyn Oliver and Colin Thornton to publish a renewed, updated edition of “City of Chaos”, a break through board game originally published in 1996 and one of the first board games to use extensive storytelling in their gameplay. The new edition is planned to release in the second half of 2019. In “City of Chaos – The Fantasy Board Game”, players explore the twisting, smog-filled streets of Byronitar, the “city of Chaos”. The city and its inhabitants are in the grip of strange, entropic forces threatening to rip the city apart. Players must uncover the clues which will lead them to the sources of Chaos, to restore order to the city. Byronitar is a richly detailed setting which offers an immersive experience to players. 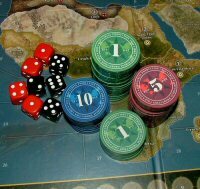 The game uses a random plot and world generator which ensures that no two games are ever alike and combines features such as tile-laying to create the game board, random events, combat, and role playing. Players can improve their characters by enrolling in many strange guilds, like The Somatologists (pacifists and healers) or The Pneumologist (use your breath as a physical force). The eccentric atmosphere of Byronitar is generated from ‘The Tome of Chaos’ with hundreds of unique paragraphs and interactions. The players must explore the city, uncover its locations and interact with its unusual denizens to discover one of the multiple sources of the chaos plaguing the streets. Byronitar is unlike any other place you have experienced. 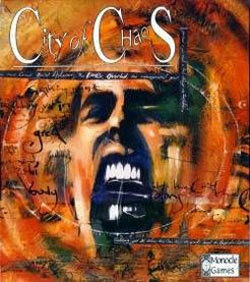 “City of Chaos is an imaginative game, with a unique setting and an innovative use of storytelling. It was groundbreaking when It was first published, and more than 20 years later, it still has a cult following. We are very excited to bring it back to the market with a new edition, improved and updated, as we feel it can still be a strong addition to today’s gaming scene”, said Roberto Di Meglio, Director of R&D of Ares Games. “We are so excited with the agreement with the team at Ares Games, an exceptional, quality publisher. Most of all we’d like to thank the dedicated players on BoardgameGeek that kept the game alive. Now we’re off for a wild dance through the streets with the Lord of Demons, join us soon!”, declared the game’s authors, Martyn Oliver and Colin Thornton.